Mike Peters rocked Australia as the Declaration tour descended into Sydney, New South Wales and Perth in Western Australia this December. 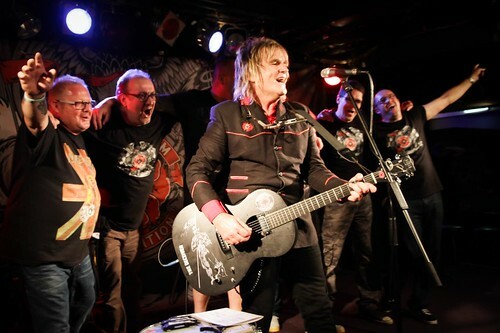 It was the first time the Alarm’s music had ever been performed down under and a packed house at the Basement in Sydney on December 4th was on hand to witness Mike Peters start at the beginning with ‘Unsafe Building’ and receive a huge welcome in response. The shows at both Sydney and Perth (December 7th), were electric in atmosphere and Mike threw the set list open to both audiences so they could hear the songs they had longed to hear in Australia for the first time. Both concerts we completely different as a result and the Sydney show in particular finished with a mass stage invasion during Blaze Of Glory. After each 2 hour performance, Mike could be seen chatting with the homegrown Australian fans including many ex-pat Brits who had seen Mike and The Alarm in the UK / USA but never before in Australia. Coupled with Mike’s trailblazing appearance at the World Cancer Congress in Melbourne (which was also attended by many Alarm fans who had been given guest tickets by organisers UICC), Australia 2014 has been a huge success and laid a solid foundation for future tours. The Declaration tour will conclude this week when Mike Peters performs in Bergen, Norway marking the end of what can only be described as a massive year for all concerned. Photos of Declaration Australia can be seen here. 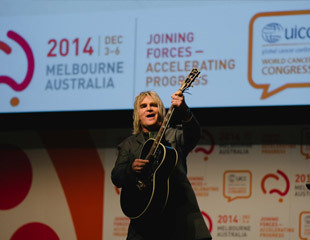 Mike Peters co-founder and rocker of Love Hope Strength Foundation raised the roof at the World Cancer Congress with his impromptu rockabilly band joined on stage by hundreds of delegates from around the world singing ‘One Guitar’ in a show of end of congress unity. 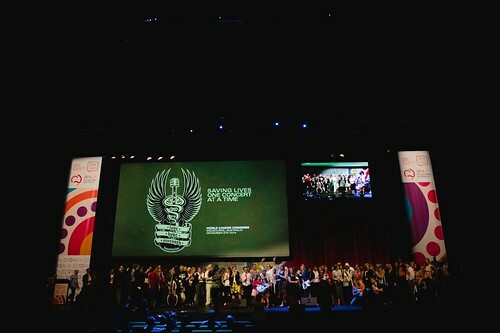 Inspiring Lives / Inspiring Music – the finale event of World cancer Congress was introduced by survivor James Chippendale who presented a 20 minute trailer of the forthcoming Love Hope Strength Documentary movie to delegates gathered inside the Melbourne Conference and Exhibition Centre. The film tells the story of the inspirational rise of Love Hope Strength into the world’s leading Rock and Roll cancer charity alongside Mike Peters personal and on going struggle with Leukaemia, and was well received by delegates who responded with spontaneous applause at various intervals. Mike Peters was then introduced to the stage and warmly greeted by a delegation that had taken the man to their hearts following his moving opening address and impromptu musical performances in the global village during the week. Mike spoke of the time he was first diagnosed with Lymphoma in 1995 saying that he “never saw cancer coming”, drawing a rousing cheer when he followed up by saying “then again cancer never saw me coming either”. He wrapped up his speech by asking the delegation to ‘show the world and cancer, that together we are stronger, that we will never give up without a fight” before taking his one guitar to centre stage for a powerful performance of ‘Without A Fight’ with it’s opening lines ‘Try to stop me…. I will carry on’. 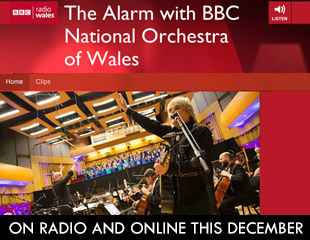 ‘Sixty Eight Guns Will Never Die” was performed for all The Alarm fans who had been allowed to take part in the finale by organisers UICC. Mike then introduced special guest Glenn Tilbrook (from Squeeze), and members of Melbourne’s Firebird Trio to join him on stage. The ad-hoc band launched into a powerful rendition of Love Hope Strength with Mike urging the delegation to come to the front of the stage and as the musicians launched into the Stray Cats ‘Rock This Town’ the whole congress was up, dancing in the aisles and rocking at the front of the stage. Mike introduced Glenn Tilbrook to centre stage and the group performed the Squeeze classic ‘Take Me I’m Yours’. Next up was a surprise version of the INXS classic ‘The Devil Inside’ which Mike dedicated to the late Michael Hutchence and referenced the time in 1986 when both The Alarm and INXS performed at Wembley Stadium with Queen. As well as being an Australian anthem, the sing hit home with this delegation as a battle cry against cancer “Every single one of us the devil inside”. ‘Rocking In the Freeworld’ kept the tempo up and was followed by ‘Wonderwall’ – a song which had meant so much to Mike and his wife Jules when they were in the USA in 1995 keeping his newly diagnosed cancer battle a secret. Woody Guthrie’s ‘Bound For Glory’ and Glenn Tilbrook’s Squeeze classic ‘Goodbye Girl’ were given a rockabilly makeover before the musicians stomped into ‘Get Down And Get With It’, which had the congress rocking even higher. The multi-cultural audience was invited to celebrate the holidays with a reading of John Lennon’s ‘Happy Xmas’ [War Is Over] and Noddy Holder and Jimmy Lea’s evergreen ‘Merry Xmas Everybody’. At the opening event Mike had invited every delegate to sign the Love Hope Strength guitar so that it could be played at the finale as a symbol of unity. Cary Adams CEO of UICC was invited on to the stage and presented with the guitar as a thank you and to take on to the next World Cancer Congress in Paris 2016. As the guitar was strummed Mike then invited every body to join him on the stage to play ‘One Guitar’. The lyrics “I’m a soldier marching in an army’ filled the room and the World Cancer Congress 2014 was brought to a close in scenes normally associated with a rock concert not a cancer congress, creating a buzz in the cancer community like nothing before. “The effect Love Hope Strength has had on this congress will not be measured by the events of December 6th 2014 alone, but by the impact it will have in the many years ahead.” said UICC CEO Cary Adams before wishing everyone well in their onward journey. Stay Alive.